It’s not a joke: Failure really can be an asset if we are trying to improve, learn, or do something new. It’s the feature that precedes nearly all successes. There’s nothing shameful about being wrong, about changing course. Each time it happens we have new options." Need a change of direction? Born in Treviso, Italy, in 1956, he graduated in architecture in 1982 at the IUAV in Venice. He is dedicated to the art, first participating in various exhibitions of painting. In 1980 he received the "Assemblage 80" in Spoleto in 1982 and was invited to the exhibition "Autoritrattazioni" at the Fondazione Bevilacqua La Masa in Venice. From 1979 to 1983 he directed a series of television documentaries on art and architecture broadcast by RAI and presented in the 10th and 11th International Festival of Films on Art and Artists Biographies, Asolo, respectively, in 1982 and 1983. Again in 1983 he opened his own design studio working in the field of architecture and design. In 1987, by the preparation of the art exhibition "The Five", Scuola Grande di San Giovanni Evangelista, Venice, and in 1989 "Lino Bianchi Barriviera" Montebelluna. Since 1988 collaborates with Euromobil and Zalf Désirée and since 1996, overseeing the design of products, showroom and fittings in Italian and international fairs. For the Euromobil Group has designed the 1999 Forum and the new exhibition. In 2000 he participated in the exhibition "Being Well Being", organized by the magazine Interni at the Triennale of Milan, with a work on the theme of the banquet kitchen. That same year he created an installation entitled "Telematics room" on the occasion of Abitare il Tempo in Verona. Both projects were made with Euromobil. One of his project was selected for I.DoT - Italian Design on Tour 2004/2005 - a traveling exhibition of the products more 'representative contemporary Italian design - first stop in New York, Chelsea Art Museum - May 2004. During 2007 and 2009, designed composition of two major retrospectives of Carmelo Zotti, edited respectively by Philippe Davenport and Brigitte Brand, the first held at the Esprit Nouveau Pavilion in Bologna and the second at the Correr Museum in Venice. Since 2007, the Euromobil Group, plans to install "places of art the places of design" at ArteFiera ArtFirst, the international exhibition of contemporary art that takes place every year in January in Bologna. The FILOANTIS kitchen reinterprets the archetype of the traditional kitchen in a very modern key. Not by chance is enriched with prestigious and eco-friendly materials, the National Walnut Wood and Ecomalta in many shades. 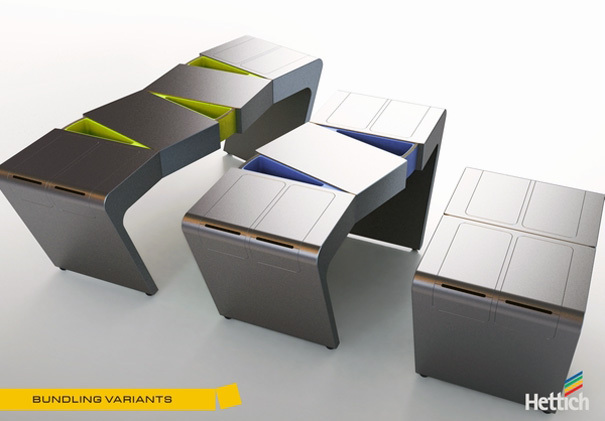 Different finishes, all deeply researched, which can live separately or combined in order to give birth to elegant visual effects. In detail: the 33° cut on door as handle grip perfectly matched to groove, the terminal base unit elements, wall and tall units with door and side at 45° and, finally, the worktops and the snack edges with a 45° inclination. Obviously the technological investment has affected also the kitchen items and use locking systems and containment of the last generation. To complete this project, the boiserie Horizon and the Cubodieci open items which add dynamism and flexibility to the entire project. The word "bespoke" comes from the term to "bespeak", ie "to give information to talk about something that needs to be done". 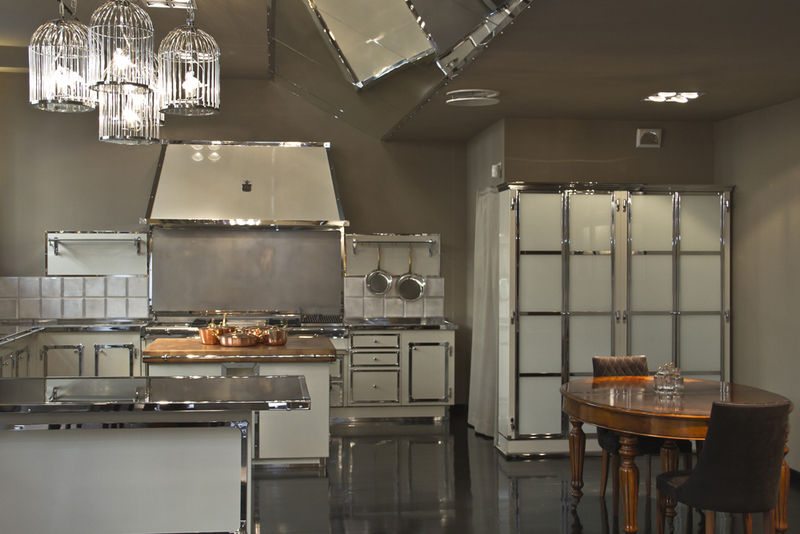 A definition that fits perfectly in a kitchen Officine Gullo: the design phase of each product which leaves the stems from an intense exchange with the client and a thorough study of the real space that the kitchen will occupy. Tailored precisely, as a tailored jacket cashmere that fits perfectly to his own or a complete soft flannel that falls flawlessly. For this Gullo kitchens are special: beyond certain traits and styles that are repeated and become the hallmark of the product, every project is different and is perfected through different stages and steps. At a first meeting with the client to understand taste and orientation, examine plants and designs, possibly following an inspection to assess the practical arrangement of space. At this point comes the first draft of the project that, once discussed and amended by the customer, is submitted to the technical Officine Gullo to verify the feasibility and functionality. So you go to render a final projection of how will be the kitchen. Defined colors and finishes and receiving the approval of the client, start the implementation phase starting right from the individual steel plates. 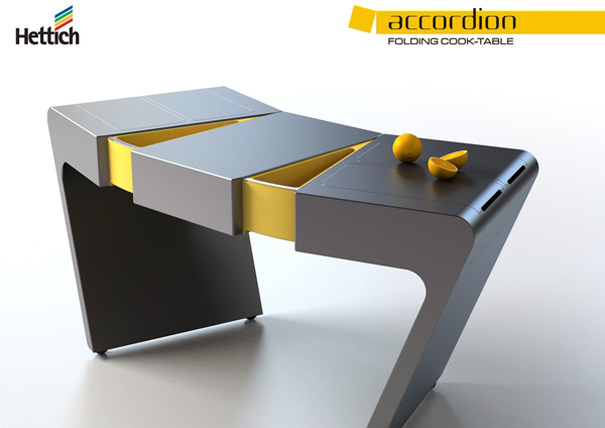 We have seen plenty of modular kitchens and counters, but the Mother of em all is the Accordion Folding Cook Table. 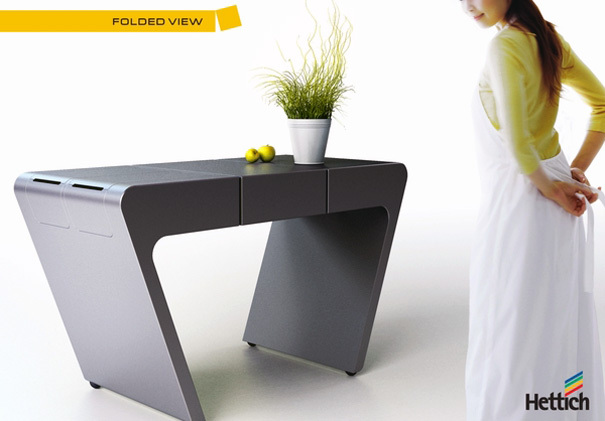 Sneaky little triangular drawers pop out from the folds of the table (that’s why it’s called the Accordion). Sliding counter tops and more drawers on the left and right side of the table, makes this the most coveted kitchen platform in my eyes. 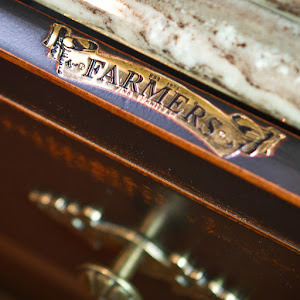 The beauty doesn’t stop here, drawer covers can be upturned to be used as preparation boards. And transparent plastic let’s you know what the boxes hold, without having to open them. 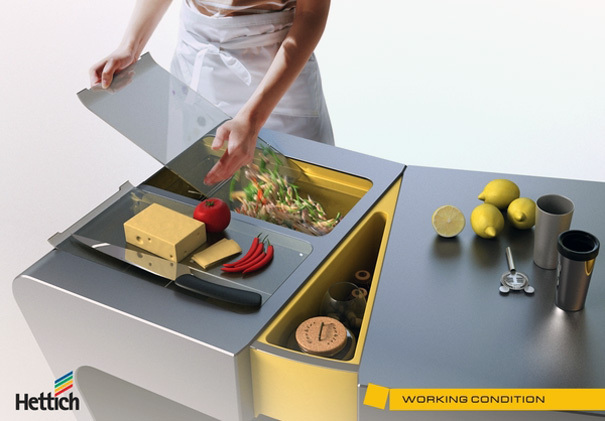 The functional modules can be configured in two to four sets, giving you the perfect kitchen! Fleur-de-lis patterned glass and smooth Corian benchtops help to create this bright and individual kitchen. For a designer, the most difficult task can often be one that lacks boundaries. When given full license to be creative, there is a risk of the resulting design becom-ing too outlandish to be effective. In the creation of this bright, glamorous kitchen, designer Mal Corboy has trodden this line with success. The only confines on the project were the shape of the room, the heritage restrictions placed on the house, and the top-of-the-line Sub-Zero refrigerator, which Corboy says was a direct request of the homeowners. "The oversized fridge had to fit both aesthetically and physically. The long, narrow room dictated an asymmetrical kitchen. Aside from this, I wanted to use some unusual materials to create something really different," he says. To avoid the refrigerator looking out of place, Corboy created two extra-wide oven towers on either side. White, back-painted glass is used for the cabinetry, while Corian is the chosen material for the island front, benchtop and sink. "Together with the frameless glass cabinets and drawer fronts, a stark smooth aesthetic is created. To then add a sculptural feel, I used a Mark Wilkinson-designed tap," he says. The island cantilevers out at one end, to further the feeling of seamlessness and flow. At the other end, a strip of LED lights visually breaks up the island front. These lights can be programmed to change colours and to flash on and off to a rhythm. Globe lighting runs the length of the island benchtop. Above the stovetop are two glass-beaded lamps which were sourced especially for this project, says the designer. "Due to heritage restrictions, we could not cut into the ceiling to create a range hood, so these lights double as recirculating fans. The beaded covers can be detached and thrown into the dishwasher for easy cleaning." To add some colour and individuality to the design, Corboy worked on the idea of a fleur-de-lis wallpaper pattern printed onto glass. After some experimentation, he found an Australian company that could create this through screen printing. "The patterned glass was used for the automatic doors that lead to a scullery behind the island, and for a section of the island front. The bright pink offsets the white island and sink," he says. The existing floorboards were slightly warped, so these were replaced with new boards, which were colour-matched to fit the rest of the house, then varnished to a high gloss, adding both warmth and shine to the kitchen. Gagenau, a small village in the Murgtal Valley, at the foot of the Black Forest. It's here that the company Gaggenau is founded in 1683 as an ironworks by Margrave Ludwig Wilhelm von Baden (1655–1707). He uses the iron ore deposits in the Murgtal Valley to open up new sources of income for the impoverished farmers, thus laying the foundation for the success story of the brand. With the ongoing industrialisation, a new chapter in the story of "Eisenwerke Gaggenau AG" begins. With a still small number of factory workers, the company manufactures agricultural machinery, metalware and tools. As a specialist in enamel, Gaggenau produces advertising signs for brands such as Odol, Maggi and Stollwerck. The recipe for the company's robust oven enamel forms the basis for the success of its coal and gas-fired stoves, which continue to be manufactured until well into the 20th century. The product range adapts to the new century. Gaggenau takes on a pioneering role with a range of innovative products, including coal and gas-fired stoves, but also bicycles. By 1908, Gaggenau has sold a total of 250,000 "Badenia" bicycles. When Dr. Otto von Blanquet takes over the reins, the company shifts its focus to coal and gas-fired stoves and produces its first electric stoves, making cooking safer and more convenient. Success proves Gaggenau's undoing: In 1944, almost all its locations are destroyed by bombing. Following the currency reform, Gaggenau begins to produce innovative ovens, which are very economical in the burning of natural gas and coal. Electric ovens are also manufactured for the first time, with 180 employees involved in producing the "Favorit" and "Futura" models. Georg von Blanquet becomes a driving force in the company. Inspired by his passion for cooking, he is fascinated by the then revolutionary idea of a custom-designed fitted kitchen with sophisticated appliances in a timeless design. In the same year, the world's first built-in appliances appear - a built-in eye level oven, a separate cooktop and the first ventilation appliance. Gaggenau presents the first 28 cm wide Vario cooktops with top-mounted control knobs - a forerunner of the now classic advanced Vario cooktops series with perfectly specialised and combinable appliances. The first 90 cm wide oven to reach the European market is bound to impress: with a generous net volume of 87 litres and space for up to four roasts at a time. The EB 300 soon achieves cult status. The Vario cooktops 300 series with 38 cm wide appliances and the characteristic front-mounted control knobs bring a piece of professional kitchens into private homes. Inspired by generously-dimensioned freestanding American fridge-freezer combinations, the Side-by-Side IK 300 is launched featuring separate access to fridge and freezer compartments. In addition to five climate zones and manual humidity control, the appliance boasts a clear ice dispenser. Gaggenau - Pioneer of healthy eating: The ED 220 steam oven, which is connected to the water supply and outlet, inspires a new trend towards an authentic taste experience based on gentle steam cooking. Asian cuisine in particular has this to thank for its triumph in the Western world. The Coanda effect: The exclusive Coanda AH 600 hood, or the AW/AI 280 as it is known today, uses findings from aerodynamic research. The unique shape of the ventilation hood leads to the emergence of an additional air current along its front edge that intercepts steam before it has a chance to escape over the edge of the appliance. This ventilation system ensures energy efficiency at reduced noise levels. The fully integrated IK 360 wine climate and temperature control cabinet with glass doors for the first time ever offers three self-contained and individually controllable climate zones. The temperature can be regulated to the exact degree between 4°C and 21°C. The first seamless ovens in the ovens 200 series with their characteristic display modules are presented. 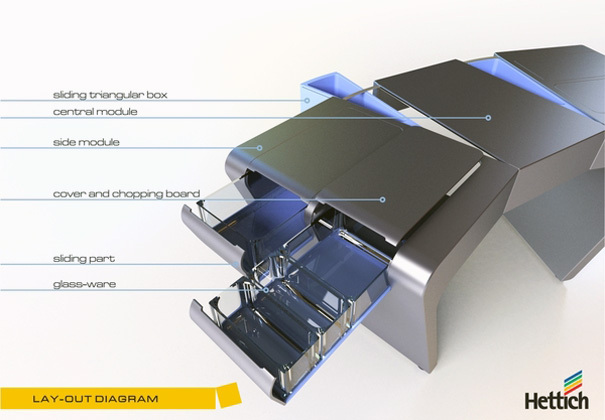 The appliances come in widths of 60 cm and 76 cm. The Vario cooling 400 series becomes established in Europe and the US as the first modular system made from fully integrated built-in appliances. Characteristic of the series are its high-quality features with lined stainless steel interiors and energy efficiency class A+. 90 cm wide, flush-mounted and featuring the most modern gas technology: The CG 492 gas cooktop also offers a power output of up to 18 kW for the first time. Minimalist design offers individual configuration options: The modular AC 402 ceiling ventilation is a flexible solution for efficient room ventilation. Motorless filter modules, control and lighting modules can be integrated inconspicuously in the respective kitchen architecture and are also extremely quiet. The CX 480 full surface induction cooktop transforms the entire surface into one homogenous cooking zone. Pots and pans of every shape and size can be placed simultaneously at any position on the cooktop, making cooking more relaxed and convenient. Intuitive control is enabled via a large TFT touch display. Vario cooktops 400 series combines advanced professional-standard technology for private kitchens with sculptural design. For the first time, cooktops with widths of 38 cm to 90 cm can be freely combined. Thanks to precision crafting of the 3 mm stainless steel the appliances can be snugly fitted side-by-side. They are flush-mounted or – to create an intentional effect – surface-mounted with a visible surround. For the play of texture, the use of recycled timber and the way the kitchen integrates in the room . 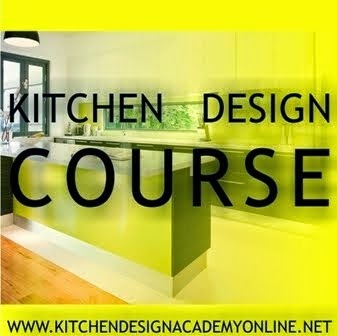 If in art everything goes in the name of art, in kitchens things are different. Very different.